Calculates Total Mortgage Payment (Principle, Interest, Taxes and Interest). Rent vs. Own? Estimates the size of a mortgage you could afford based on the size of your current monthly rent payment etc. Fixed Rate vs. Adjustable Rate Mortgages Compare a fixed rate mortgage with both fully-amortizing and interest-only adjustable rate mortgages (ARMs). Should I Refinance? Will help you to decide whether or not you should refinance your current mortgage at a lower interest rate. Adjustable Rate Mortgage Calculation Will help you to determine what your adjustable rate mortgage payment will be. Mortgage Rate Comparison Will help you to compare monthly payments and interest costs of home mortgages at up to five interest rates simultaneously. Sellers Net Proceeds Calculates an estimate of seller's net proceeds after deducting the closing costs involved in selling a home. 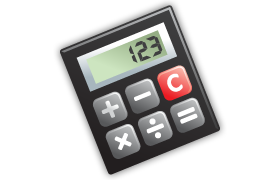 Mortgage Payoff This calculator will show you the additional monthly payment you will need to make on your current mortgage in order to pay it off within a specified number of years.